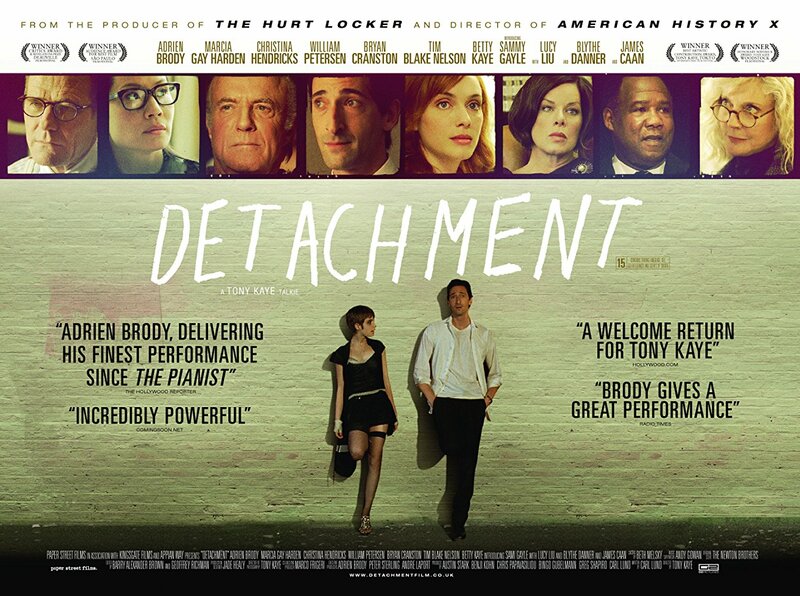 Director Tony Kaye’s (AMERICAN HISTORY X) long-awaited film DETACHMENT stars Academy Award® winner Adrien Brody as Henry Barthes, a substitute teacher who conveniently avoids any emotional connections by never staying anywhere long enough to form a bond with either his students or colleagues. A lost soul grappling with a troubled past, Henry finds himself at a public school where an apathetic student body has created a frustrated, burned-out administration. Inadvertently becoming a role model to his students, while also bonding with a runaway teen who is just as lost as he is, Henry finds that he’s not alone in a life and death struggle to find beauty in a seemingly vicious and loveless world. Kaye has molded a contemporary vision of people who become increasingly distant from others while still feeling the need to connect. DETACHMENT features a stellar ensemble cast, including Academy Award® winner Marcia Gay Harden, Christina Hendricks, William Petersen, Bryan Cranston, Tim Blake Nelson, Lucy Liu, Blythe Danner, James Caan, and newcomers Sami Gayle and Betty Kaye.